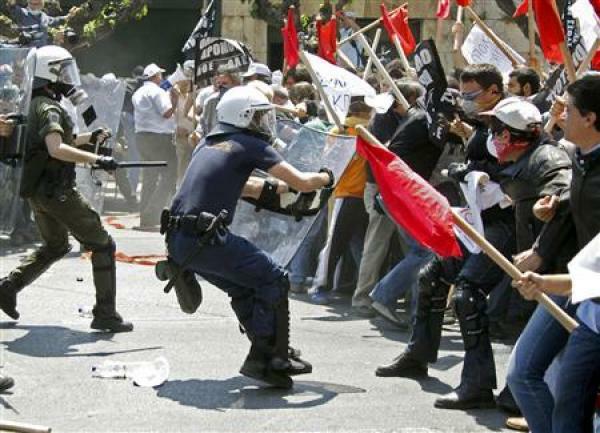 Greek Workers Protest Austerity Plan: “Hundreds of demonstrators took to the streets in Greece on Tuesday, unfurling banners over the Acropolis to rail against new austerity measures aimed at helping the debt-ridden country stave off economic disaster. Greeks strike against austerity, test govt mettle: “ATHENS, May 5 (Reuters) – Greek protests against new austerity measures are set to swell on Wednesday when public and private sector workers take to the streets together in a test of the government’s resolve to enforce tough budget cuts. About 4,000 teachers, garbage collectors, pensioners and civil servants rallied in Athens on Tuesday, in the first march organised by unions after the government announced sweeping spending cuts to secure an EU/IMF rescue package. Greece’s Stumble Follows a Headlong Rush Into the Euro: “The economic challenges facing the European Union unsettled investors around the globe on Tuesday as hundreds of demonstrators took to the streets in Greece, unfurling banners over the Acropolis to protest the government’s new austerity measures. Euro market meltdown resumes despite Greek deal: “A renewed selling frenzy gripped euro zone financial markets on Tuesday as concern mounted that a record EU/IMF bailout for Greece would not stop a debt crisis spreading in the single currency area. Greek woes hit Asian shares, euro down: “(Reuters) – A tumble in global stocks spread to Asia on Wednesday on heightening fears that Greece’s debt woes could spread to other countries. “One gets the feeling that the euro zone is turning out to be a basket case and of course rumors about Spain and Portugal’s sovereign debt isn’t helping. I suspect the market wants to take the euro to as low as $1.25 in the short term,” said Joanthan Cavenagh, currency strategist at Westpac, Sydney. Greece: The default option: “For Greece and other cash-strapped nations, bankruptcy seems to be the ultimate fear. But should it be? George Papandreou had to make one the toughest speeches by a European prime minister today, announcing he had bowed to the demands of the EU and IMF and agreed harsh economic reforms to avert bankruptcy in Greece. At an emergency meeting of his cabinet, the first held on a Sunday morning, the socialist leader effectively conceded defeat in the battle to deal with the debt crisis without international aid. 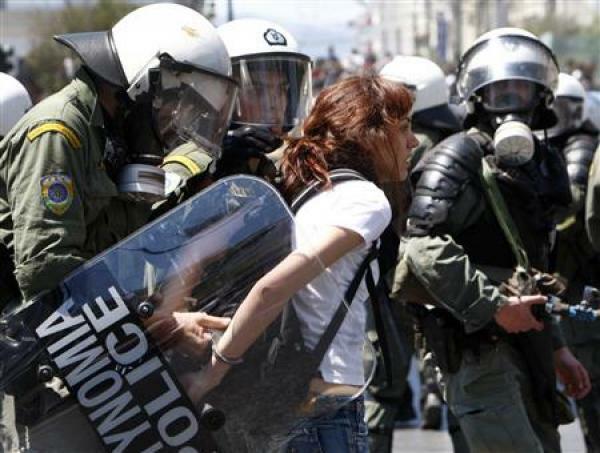 Papandreou told Greeks, who have taken to the streets in protest against the austerity drive, that they had to chose between a rescue or an economic collapse…. The deal will be sealed in Brussels this evening and could see Athens receiving as much as €140bn (£122bn) over the next three years, the biggest international bailout ever. Civil servants will lose up to two months in wages, with salaries and pensions being frozen during the three-year programme. Job losses will also increase…. Under the deal, agreed after 10 days of intense negotiations with the IMF and EU, VAT will also rise by two percentage points from the current 21%. Duties on fuel, cigarettes, alcohol and luxury goods will similarly increase by 10%. European countries stepped into uncharted territory tonight, deciding on the first bailout of a single currency member state by agreeing a three-year package worth ¤110bn (£95bn) to rescue Greece from financial meltdown in return for pledges on the most drastic overhaul of a European economy ever attempted. The fear of contagion has spread over Europe. Many see Greece as the potential first domino to fall in a scenario that runs as follows: the Greek austerity measures do not suffice, the debt crisis deepens, and the risk of a sovereign default spreads to other European economies. As the Greek domino falls, countries like Portugal, Spain, or Italy start tumbling, and a small economy’s crisis turns into a major European calamity. This view suggests that other countries might be forced to rush and help their European ‘brothers in arms’ – whether or not Berlin or other capitals want to. Eventually, the sovereign debt crisis might hit the real economy, with Europe ending up in a vicious circle of even higher deficits, lower growth rates, exploding unemployment and decreasing competitiveness. This entry was posted in Current Events, Economics, Politics and tagged Europe, financial crisis, Greece, IMF/World Bank, protests. Bookmark the permalink.